Guess being a 27-year-old liar is cool to New Yorkers. Hey, it was cool to be a 28-year-old liar with Ocasio-Cortez. 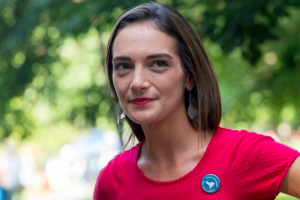 Julia Salazar, a democratic socialist whose campaign for a seat in New York’s state Senate was overshadowed by a series of bizarre revelations about her past, unseated a 16-year incumbent in Thursday’s Democratic primary. With 88 percent of precincts reporting, Salazar led state Sen. Martin Dilan by 58 percent to 42 percent. She will not face a Republican opponent in November. Salazar’s victory in the Brooklyn-based 18th Senate District added her to the list of insurgent Empire State Democrats who have knocked out established incumbents this primary season. The 27-year-old first came under scrutiny last month when the online magazine Tablet reported that, contrary to her claims of being an immigrant from Colombia who struggled financially, Salazar actually was born in Florida and had hundreds of thousands of dollars in a trust fund.